Мурманск (Murmansk) - Administrative center of Murmansk Oblast, located in Kola Bay, otherwise known as Кольский залив with залив, of course, meaning bay or gulf. Казань (Kazan) - Capital and largest city of the Republic of Tatarstan (Республика Татарстан). 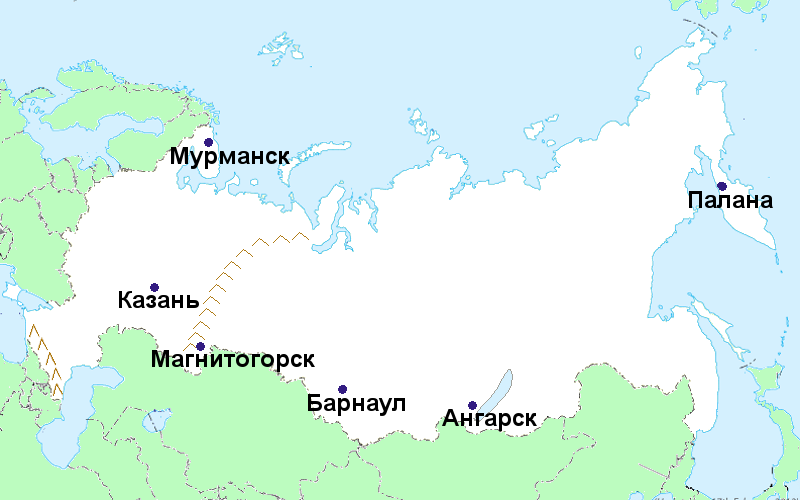 With a population of over one million people, it’s the eighth largest city in Russia. Магнитогорск (Magnitogorsk) - A city of about 400,000 located just east of the south end of the Ural Range near a mountain of almost pure iron called Magnitnaya Mountain. Барнаул (Barnaul) - A city of about 600,000 located along the Ob River and administrative center of the Altai Krai (Алтайский край). Ангарск (Angarsk) - A city of about 230,000 located just 51 kilometers west of Irkutsk. Палана (Palana) - Town located on the Kamchatka Peninsula (полуостров Камчатка) and is the administrative center for the Koryak Okrug (Корякский округ). Ангарск находится всего в пятидесяти одного километрах к западу от Иркутска. Магнитная гора почти чистое железо.